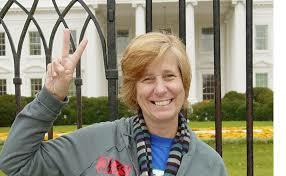 Cindy Sheehan flashes a peace sign outside the White House. Cindy Sheehan lost her son,Casey, four years before I lost my Mike. He was killed in Iraq, in a war fought for power in an oil-rich region, in a country where we hoped we would be able to control the oil. But Sheehan did get up and move again, and with great determination, to create a world where people’s children don’t die from the foreign adventures of imperialist powers. She bought land near the ranch of then-president George W. Bush and made sure Camp Casey was visible to anyone going to the ranch — a reminder that public policy has consequences, usually for people who don’t deserve those consequences. I admired the hell out of her then, as I still do. But now I’ve gotten to know her a bit and I love her. I love her fierce determination to bring about peace, to educate others about the damage caused by wars — even those far away that seem to have little effect on most of us here in the US. I love how she stands up and speaks truth to power — even roundly criticizing Barack Obama again and again for his continued use of drones. She holds Republicans and Democrats in equal disdain for the policies that perpetuate war and for their support of the war economy that bleeds the nation dry. But all of us are complicit in these wars, whether we know what’s being perpetrated in our name or not. We’re complicit because we vote for the people who continue our overseas adventures, or we don’t vote at all. We’re complicit because we should know what’s happening and we don’t, and even when we find out, most of us don’t take action to put a stop to it. Before the Women’s March on Washington, Sheehan approached organizers to ask that they condemn war and the war economy, since war and the imperialism that feeds it are “the biggest purveyors of violence against women in the world.” The organizers said they would address other issues when all women are free. “I took that to mean all Democratic white women,” Sheehan says. Someone suggested she hold a mock women’s march on the Pentagon, and she decided a real march would be more effective. She set the date for Oct. 21 and put it up on social media (it’s on Facebook at https://www.facebook.com/events/184236778838247/), with a Children’s Peace Festival the day before. Immediately, people started jumping on board, eager to help. Most of the people who have become involved in the march so far are women, Sheehan says. Sheehan is criticized often for her in-your-face style, but I agree with her and it’s my preferred style as well. Not everyone can stand up after the loss of a child and speak publicly to confront those responsible. It’s a skill some of us are born with, and it helps me fell less alone. I’m grateful Cindy and I have the ability to speak truth to power. “They want us to go away and grieve quietly,” she says. “But why shouldn’t they have to have our grief thrown in their faces? Why should we be the only ones suffering? Sheehan is not polite about her disdain for war, or about her fury at the way innocent young black men are being murdered by police and then vilified by media as petty criminals, as though the petty crimes they MAY have committed merit the death penalty without even a sham trial. When people argue that she’s being unfair, that police have a dangerous job, Sheehan answers by posting on social media a list of jobs that are more dangerous (a higher number of injuries and deaths) than police work. “Grounds maintenance. Grounds maintenance is more dangerous,” she says. I would be much happier to have my son still with me. His death radicalized me, as Casey’s death did to Cindy. Neither of us wanted to be a troublemaker. That’s just how our lives worked out, and neither of us is leaving this fight for the soul of our nation until we succeed or we die. I plan to stand with Cindy Sheehan on Oct. 20 and 21. I plan to demand we stop wasting our precious children’s lives and spend that money on something useful — like creating jobs to fix the nation’s crumbling infrastructure or making college free. It’s time to listen to the women — especially those women who have been harmed the most by our really bad public policy. We’re not going to shut up until you do. And we’re not going to be polite about it, either.